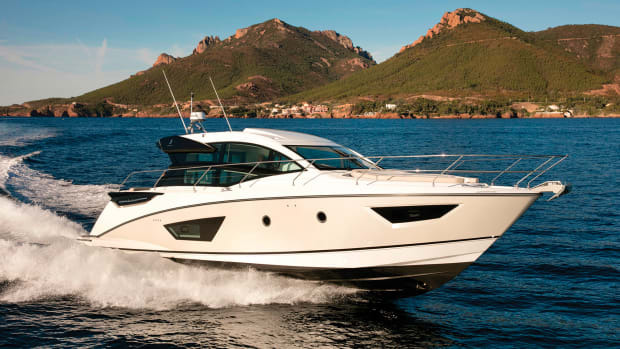 The Prestige 520, an evolution of the popular 500, attracted huge crowds when it debuted at Cannes. Sometimes you’ll see a nice selection of designer shoes (think polished Italian loafers). Other times you’ll spot a couple pairs of flip-flops. 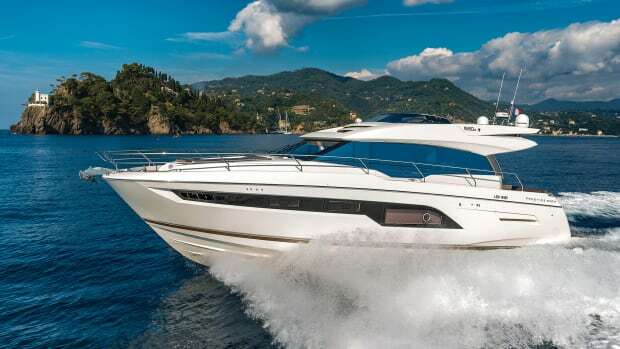 Every time I walked passed the Prestige 520 at the Cannes Yachting Festival in September I saw piles of shoes of all shapes and sizes: boat shoes, dress shoes, designer shoes. 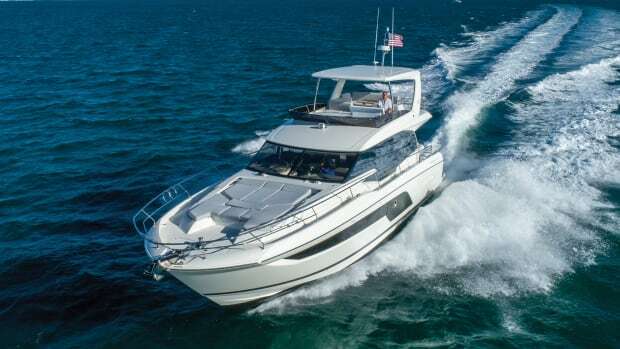 The point being the 520 was packed with visitors during the entire duration of the show. I set up an appointment with Prestige America’s President Nick Harvey to see what all the fuss was about. The fuss, he explained, was expected. 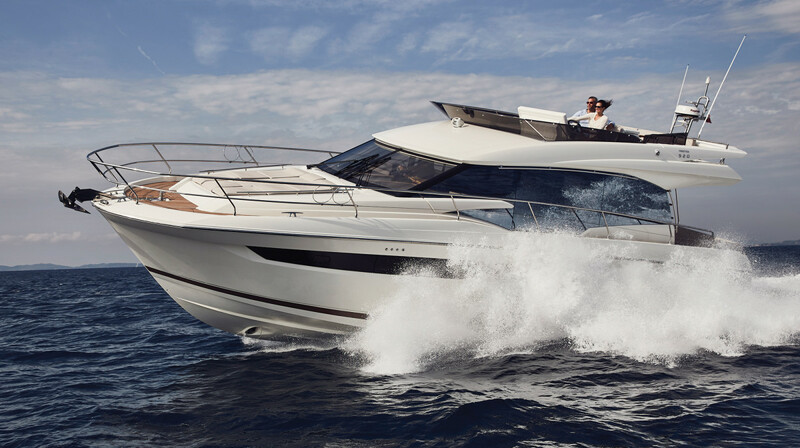 The 520 is the evolution of the brand’s popular 500, of which, coincidentally, 500 have been sold in the six years since its launch. 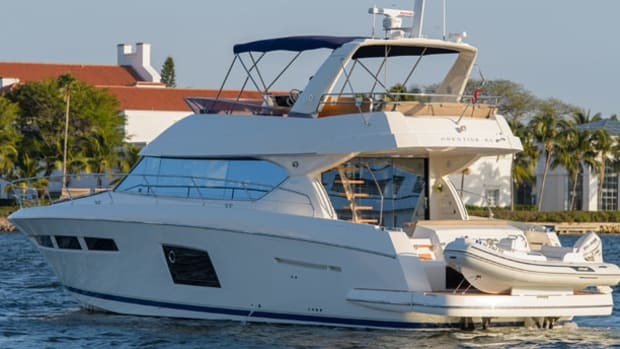 “We’re still offering the 500 because it’s still really in demand and at a slightly lower price point,” explained Harvey as we ducked past a group touring the boat. 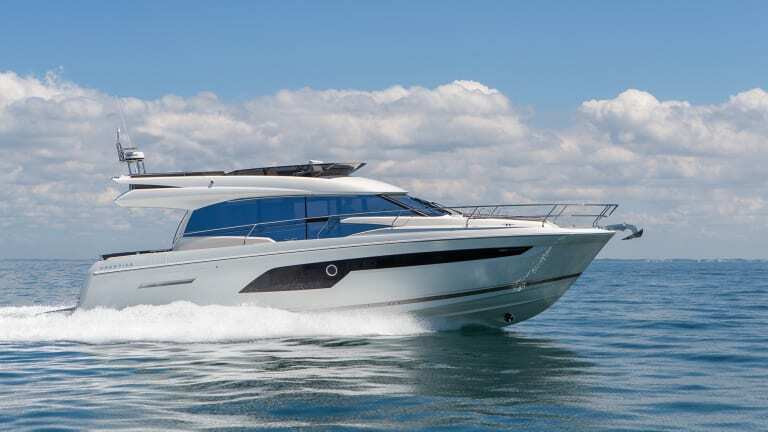 Indeed, the 520 is essentially the same hull as the 500, but with updated features and styling that reflect years of customer feedback. 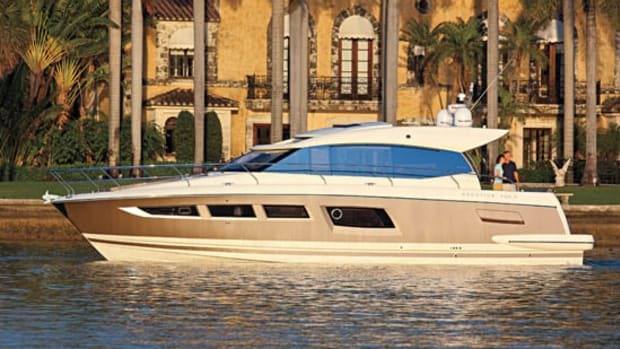 The changes start in the hull, where the fiberglass for the 500 is hand-laid, and the 520 is resin-infused. 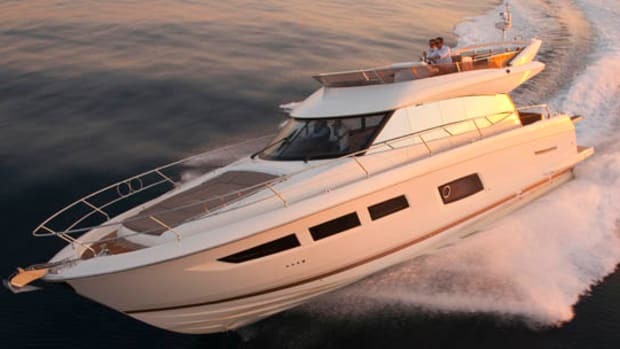 From the hull up there are tweaks to the layout that take a careful eye to really appreciate. 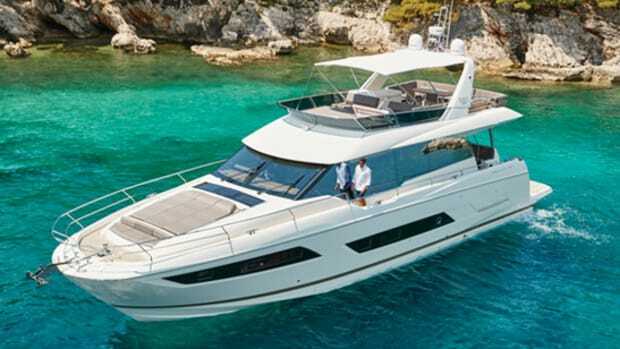 Things like the L-shaped sofa in the cockpit, a more modern/angular helm on the flybridge, a redesigned radar arch, a sunpad on the bow with a new adjustable seatback. It seems everywhere you look, Prestige has updated something. 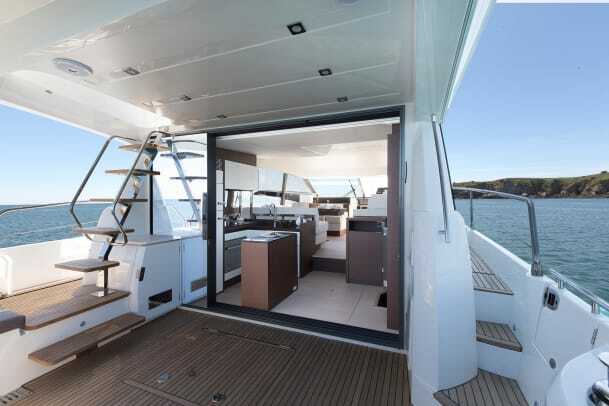 One of the major changes Harvey pointed out was the sitting area in the salon; it’s to starboard just behind the helm. It’s a clever little seating area that is raised to allow for better views underway. 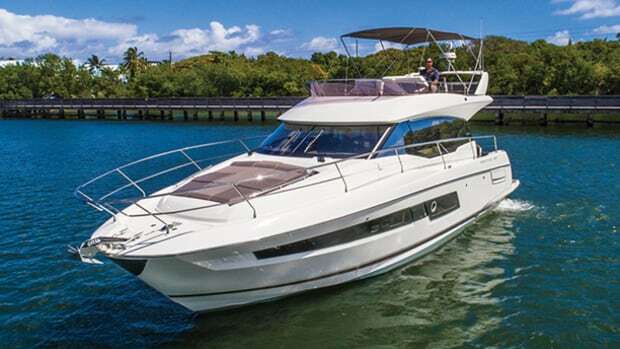 The helm itself—with a bench seat for two—has an electrically adjusted seatback that actually raises and lowers at the push of a button. Push up and you’re sitting squarely at the helm with the ocean before you. Push down and it lowers, and suddenly you’re facing as many as 10 seated guests sharing the space with you. In -between these two seats is a side door that customers demanded. I walked through it a couple times and noted how easy it was to get in and out, no morning calisthenics or gymnastics experience required. I’ve learned from experience on other Prestige models that this builder puts a passagemaker-level premium on stowage. Every nook and cranny is used, which means there’s usually a creative space solution on each model. The 520 is no different. In the corner of the master stateroom is an angular closet that Harvey walked into for effect. On many boats it’s a space that would go unused or be dedicated to wire runs. Here you could hang enough clothes for a week or two underway. Many of the differences between the 500 and the 520 may seem small, but in many ways it’s the details that were improved. When you add up all those little details, you realize this is a new model with a mountain of shoes behind it and a full order book ahead. 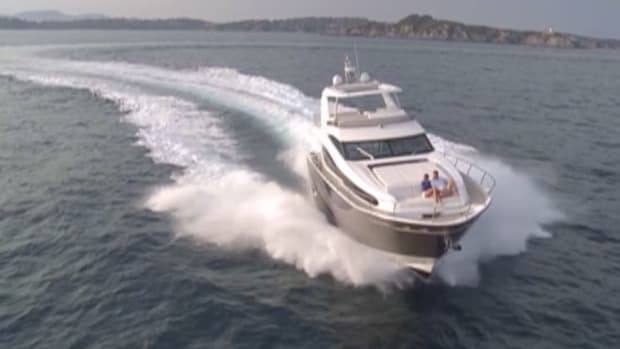 VIDEO: Join us on our tour of the Prestige 520 at Cannes.